This Cosmos Phase II ultralight was used by Canada-based Operation Migration. This non-profit organization reintroduces endangered whooping cranes and other species by leading them on their migratory routes in ultralight aircraft. It is on display at the National Air and Space Museum's Steven F. Udvar-Hazy Center. A conservation group called Operation Migration, dedicated to replenishing the numbers of endangered birds such as Whooping cranes, used this two-seat ultralight to lead flocks along new migration routes up to 4,025 km (2,500 miles) long, from Canada to the southern United States. Pilots averaged about 50.6 km/h (31 mph) when leading the birds, but occasionally they flew as fast as 112.7 km/h (70 mph) and as high as 1,216 m (4,000 ft). Operation Migration staff added the propeller guard, GPS navigation unit, and sound systems to broadcast adult crane calls during flight. The ultralight also appeared in the Hollywood film "Fly Away Home." The term 'trike' refers to the tricycle landing gear fitted to the cart suspended beneath the wing. The cart contains the cockpit and engine. Frenchman Roland Magallon developed a microlight aircraft called the Mosquito in 1979 to fill the need for an aircraft combining the simplicity and maneuverability of hang gliders with the stability and flexibility of more traditional powered, fixed-wing aircraft. As the unique configuration became popular, it acquired the nickname 'trike' in reference to the distinctive three-wheeled enclosure suspended beneath the wing and containing the cockpit and engine. Thirteen years the Mosquito, another French designer named Renaud Guy introduced the Cosmos Phase II in 1992. He marketed the aircraft to pilots who wished to operate from airfields, snow, or water, and to those who wanted a good training aircraft. The trike soon found favor as a stable platform for aerial photography, and for towing aloft hang gliders. The pilot flying a Phase II could takeoff and land in less than 61 m (200 ft) and expect to fly approximately 322 km (200 miles) under most conditions. The ultralight cost about $14,000 in early 2004. Production ended in 2005 after dealers sold more than 800. Trike ultralights such as the Phase II is well-suited to lead the migrations of large birds. Pilots can safely match the bird's cruising speed, which for Whooping cranes is about 24 km/h (38 mph). 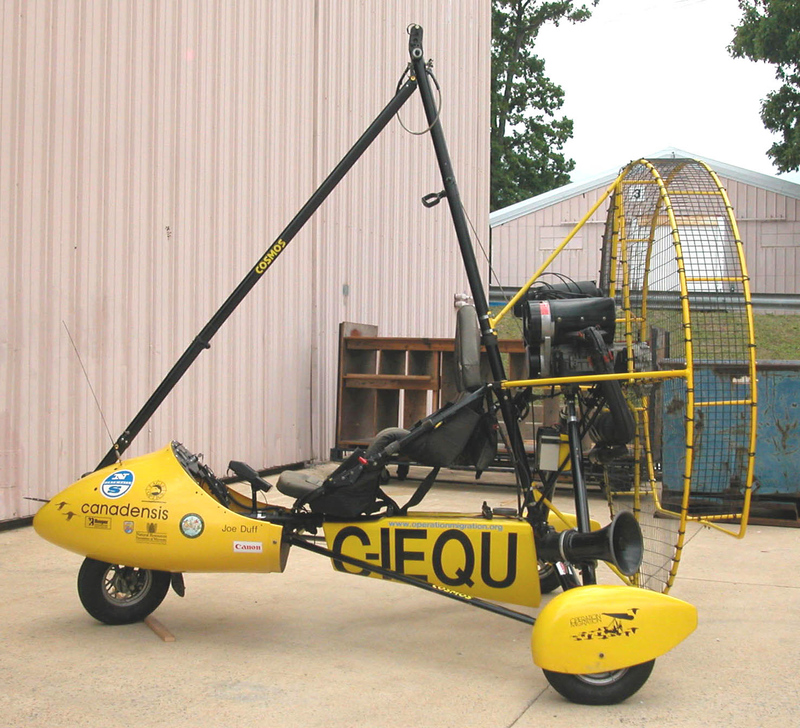 Trikes are highly maneuverable, they provide excellent visibility, and a guard is fitted easily to the aircraft to shield the birds from the spinning propeller. Direct control of the wing via the crossbar allows a pilot to concentrate more attention on the flock's position relative to the ultralight. Operation Migration is a member of the Whooping Crane Eastern Partnership, along with seven organizations dedicated to saving the Whooping crane from extinction. For many bird species, the ability to migrate is a learned process. Canadian Bill Lishman founded Operation Migration as a non-profit charitable organization in 1994 to develop methods for teaching captive-reared birds to migrate by following ultralight aircraft. Lishman got the idea after watching John Moody fly his Easy Riser at Oshkosh in 1976. Another Canadian, Bill Carrick had trained Canada geese to fly alongside his motorboat using methods pioneered by the 1973 Nobel Prize-winning animal behaviorist, Konrad Lorenz. Carrick encouraged Lishman who in 1988 succeeded in training geese to fly with his own Easy Riser ultralight during short flights near his farm. Lishman teamed with Joe Duff in fall 1993 and the two Canadians led 18 Canada geese from Port Perry, Ontario, to Warrenton, Virginia. Thirteen of the birds proved that the idea worked when they returned to Ontario from Virginia the following spring. Standing at 1.5 m (5 ft), Whooping cranes are the tallest birds in North America. Their wings span 2.1-2.4 meters (7-8 ft) and they prefer to sleep standing in shallow water to deter predators. They feed on clams, frogs, crabs, and aquatic plants and they mate for life. Whooping cranes are the rarest of the world's 15 crane species. Biologists have estimated they once numbered between about 500 and 1,400 before European settlement began to alter their habitat in 1870. The population had dwindled to just 15 Whooping cranes by 1941 but rebounded to 200 wild birds by 2004. Despite their recovery, a single catastrophe such as a hurricane, avian disease, or a chemical spill could extinguish the species. Teaching the cranes to follow the ultralights begins before they hatch when aviculturalists expose the eggs to the recorded sound of an ultralight engine. At around 5-7 days old, a silent and disguised aviculturalist wearing a hand puppet that looks like the head and neck of an adult crane introduces each chick to an ultralight aircraft, accompanied by recorded crane brood calls to reassure the youngster. A bird seeing a human face or hearing a human voice while under the staff's care could 'imprint' on humans, losing its natural fear and dramatically decreasing its odds of surviving in the wild. As the bird matures, it will after a few years lose interest in the ultralight. By eight weeks, the bird is following the ultralight as it taxis and flying with the aircraft when the crane is 80-90 days old. Training flights can last as long as a half-hour and each chick can require an average of more than 11 hours to train. The ultralight pilots lead the Whooping cranes along a migration route that stretches 1,932 km (1,200 miles) across seven states, Wisconsin, Illinois, Indiana, Kentucky, Tennessee, Georgia, and Florida. In 2005, the Operation Migration staff arranged accommodations for the birds at 38 sites spaced from 32 km (20 miles) to 113 km (70 miles) apart, each one selected to avoid populated areas. The migration that year lasted 50 days, split about evenly between flying with the birds and waiting for flyable weather. With the help of a tail wind, a single flight leg can cover 322 km (200 miles) in just over 3 hours. When either weather or cranes refuse to cooperate, a flight can cover less than 37 km (23 miles). After taking off, the Whooping cranes jockey for the best position and then 'surf'' the strong wing tip vortex generated by the ultralight. A bird can fly with considerably less effort from this coveted position. The other birds maneuver into a diagonal line, wingtip to wingtip, each surfing a similar but less intense vortex generated by flapping wings. The flock settles down and all goes well until, without warning, the crane surfing the ultralight (which it considers another crane thanks to months of careful imprinting) decides to challenge aircraft for the right to lead the formation. The other birds follow and quickly envelope the aircraft. The pilot is suddenly "IFR in cranes" with no choice but to back away from the gaggle, climb above it, and then drop back into the lead. A particularly aggressive bird will sometimes repeatedly challenge for the lead until the ultralight pilot is nearly exhausted. Crossing the Appalachian Mountains is the most difficult part of migrating with the birds because of the elevation but there are other hazards in the air and on the ground. The birds will follow the ultralight as it descends to treetop height or climbs to several thousand feet, however, low flying is dangerous. Cranes have been injured and killed in collisions with power lines and aircraft. One year during an overnight stop, a Whooping crane succumbed to a bobcat. Another year, a crane probing mud for food lodged its beak inside a spent shotgun shell. An ultralight pilot noticed the bird's predicament during flight and plucked the shell after landing. The birds can tire, break formation, and land, often taking several flight mates with them. When this happens, one of the two ultralight pilots supporting the lead aircraft gives chase, rounds up the stragglers, and then reunites them with the main flock as soon as possible. As John Christian of the U. S. Fish and Wildlife Service said, Operation Migrations' work "is the wildlife equivalent of putting a man on the moon." A significant step toward establishing what biologists believe is necessary to insure species survival - two independent groups of 25 wild breeding pairs that can migrate on their own - occurred in March 2006 after a Whooping crane trained using the Operation Migration ultralights migrated on its own from Florida to Wisconsin, the first to do so in more than 100 years. Yet the year also saw the program threatened by land development. Pilots noted a significant increase in the number of houses and businesses occupying once wild habitat along the migration route. The staff must abandon a regular stop in Tennessee because developers had planned to build 1,000 new homes adjacent to the site in 2007. A crane nest site in Florida is also threatened. Despite many difficulties, Operation Migration has developed one of the most innovative and important wildlife conservation programs in history. They are well on their way to saving a species from extinction, and their efforts have boosted public interest in wildlife conservation. Joe Duff's role was critical to the program's success. He led the organization from its inception and developed the training protocols. By 2007, Duff had flown with birds longer than anyone had. He and his staff also led migrations of Trumpeter swans and Sandhill cranes. Pilots volunteering for Operation Migration flew the Phase II now belonging to the NASM. Using this aircraft, they led Canada geese to South Carolina in 1995, Trumpeter swans to the Chesapeake the following year, Sandhill cranes in 1997, 1998, and 2000, and the first Whooping cranes from Wisconsin to Florida in 2001. In 1996, the aircraft also appeared in the Columbia Pictures film Fly Away Home, starring Anna Paquin and Jeff Daniels. The trike is equipped with a custom-built bird guard enclosing the propeller; radios, GPS navigation, and a sound system to broadcast adult crane calls while flying with the birds. Gift of Joseph W. Duff, CEO Operation Migration.